Two researchers, one with Biofaction in Austria, the other with Université de Toulouse in France, report an example of ants (Azteca brevis) in Costa Rica who have developed a truly unique way of capturing prey that are much larger than they are. As Markus Schmidt and Alain Dejean describe in their paper published in the Biological Journal of the Linnean Society, the ants have found a way to take advantage of the impact a type of fungus has on trees to help them capture prey. As Schmidt and Dejean note, a type of fungus grows on tree branches in the Piedras Blancas National Forest, in Costa Rica. 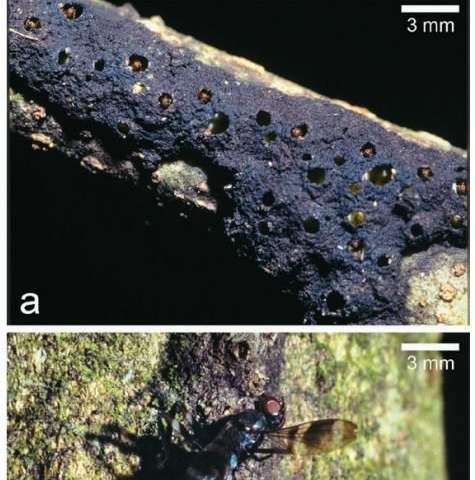 In addition to creating a dark residue on the branches, the fungus softens the bark, which allows the ants to dig tiny holes and build a nest beneath it. The holes, the researchers note, are just big enough for the ants to crawl into and hide—and for trapping the feet of crawling insects. Once an insect's foot falls into a hole, the ant that is hiding in it latches on and begins pulling. As the insect attempts to free itself, it flails about, trapping its other feet (and sometimes antennae) in other holes where there are more ants hiding. They, too, clamp onto the insect and begin pulling—together, the ants trap the spread-eagled insect, preventing it from escaping. What happens next depends on the size and nature of the captured insect. For those that that are large and can still fight back, the ants simply hang on until it dies—a wait that can last for hours. For those that are smaller or weaker, other ants emerge from holes in the tree and attack. In either case, the insect is eaten where it was killed. The researchers report that the technique allows the ants to capture prey almost 50 times larger than they are. They further report that it is an example of an extended phenotype, which was introduced by Richard Dawkins in 1982 to describe all effects that a gene has on its environment, whether inside or outside the body of an individual organism. Azteca brevis Forel, a dolichoderine ant species, builds along the branches of its host plant galleries that bear numerous holes slightly wider than a worker's head. We noted that the workers hide, mandibles open, beneath different holes, waiting for arthropod prey to walk by or alight. They seize the extremities of these arthropods and pull backwards, immobilizing the prey, which is then spreadeagled and later carved up or pulled into a gallery before being carved up. The total duration of the capture ranges from a few minutes to several hours. This ambush group hunting permits the capture of insects of a wide range of sizes, with the largest being 48.71 times heavier than the workers, something that we compared with other cases of group hunting by ants and trap use by other arthropods. A convergence with myrmicine ants of the genus Allomerus is shown. Thus, this study also shows that the genus Azteca presents the largest panel of group hunting strategies by ants and that there is polyethism related to polymorphism, as hunting workers are larger than their nestmates. We concluded that these gallery-shaped traps correspond to the notion of 'extended phenotype'.